The Wyoming Valley was once home to a motion picture studio, and folks this weekend will have an opportunity to watch one of the silent films made here, along with a Hollywood classic. The silent movie was filmed at a studio on Slocum Street in Forty Fort by the United States Motion Picture Corporation, and produced at the company’s offices in Wilkes-Barre in October 1917, said Forty Fort Mayor Andy Tuzinski. “It’s known as a ‘Black Diamond Comedy,’ referring to the coal mining in the area. The Black Diamond Express was a Lehigh Valley Railroad train,” Tuzinski noted. “I’m very interested in local history, and this is something I’ve known about for years,” the mayor said, adding that he thought an “Adult Night” for Forty Fort’s “Movie in the Park” series would be the perfect venue to show a film produced in the borough. When Tuzinski contacted the Luzerne County Historical Society about borrowing a copy of the film, he learned that King’s College English Professor Noreen O’Connor had a copy she obtained from UCLA Film Archive and had been researching. O’Connor said she has been researching the history of locally-produced films — made when the East Coast was still home to the movie industry before it moved to Hollywood — about five years ago, after Tony Brooks, then director of the county historical society, spoke to one of her classes and mentioned that the local film company had a listing on the Internet Movie Database (www.IMDb.com). “This was kind of like the first Hollywood,” O’Connor said of the New York/New Jersey/Pennsylvania tri-state area. 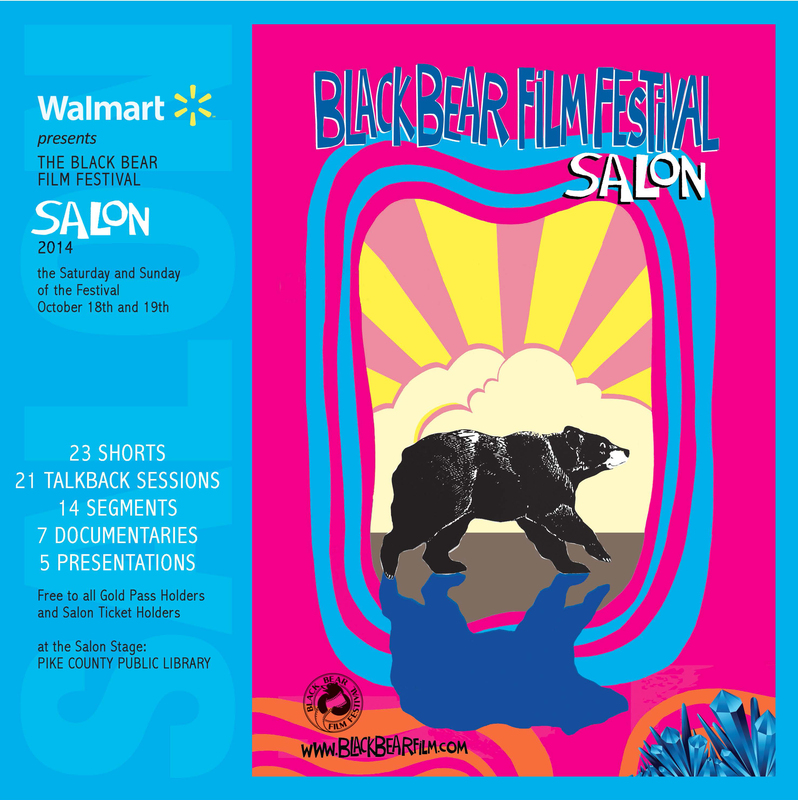 O’Connor said she presented two of the Black Diamond films last October at the Black Bear Film Festival in Milford. She brought along a musician accompanist who played guitar with the films, and then she answered questions. She would have offered a similar presentation on Friday in Forty Fort, but she has a business trip scheduled for that day, she said. 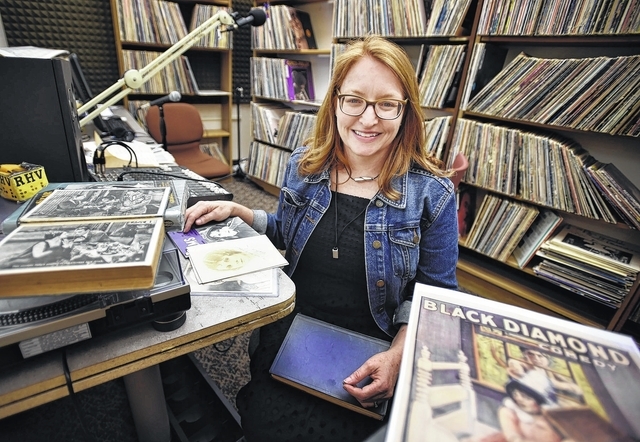 A movie poster for the Black Diamond comedy ‘Susie Slips One Over’ is among the local film artifacts that King’s College Professor Noreen O’Connor has collected in her research. 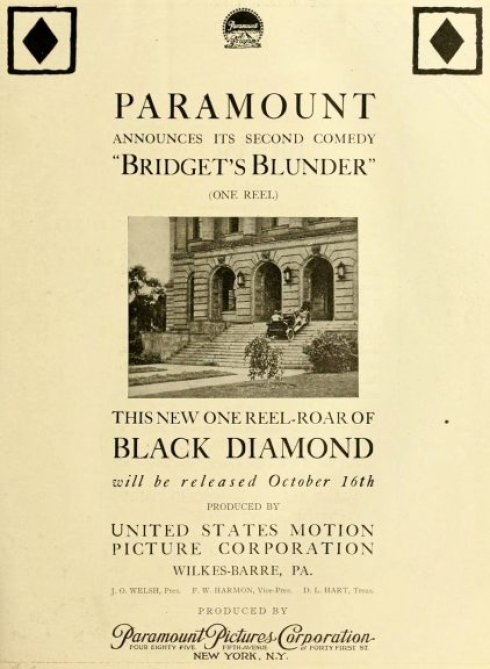 Between Oct. 2, 1916 and Nov. 12, 1917, the United States Motion Picture Corporation produced and released 27 Black Diamond Comedies, O’Connor said. The one-reel silent films were the first comedies distributed by Paramount Pictures, which was then based in New York. Paramount advertised these comedies widely in 1917. Though most of the films themselves are now lost, the films’ advertisements appear in publications such as The Moving Picture World magazine, and copyright information is held at the Library of Congress, O’Connor noted. After the company ended its contract with Paramount Pictures in 1917, USMPC released six additional one-reel comic films as Unique Comedies, which were distributed by the Arrow Film Company of New York. These appear to be films originally created for release as Black Diamond Comedies. The company offices for USMPC were in Wilkes-Barre, but the actual film studio was in Forty Fort on Slocum Street, she said. 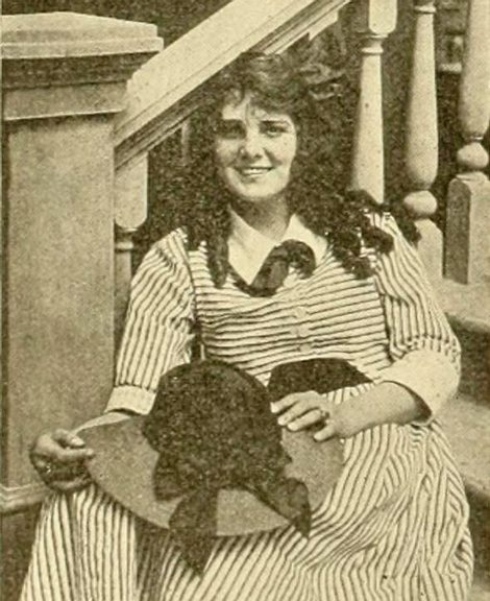 The films often followed a comic character named Susie, portrayed by USMPC’s leading lady Leatrice Joy, through mishaps and blunders. Joy was a well-known actress with a “flapper” persona in the 1920s, and she was one of the silent stars whose career continued beyond the introduction of “talkies” as well. She has a star on the Hollywood Walk of Fame. O’Connor also noted that the comedy “His Neglected Wife,” which also stars Joy, was discovered with many other old films in a vault in New Zealand and was returned to the United States for restoration at George Eastman House in 2010. Local historian Charles Petrillo helped pay for the restoration. The film “Susie Slips One Over” in addition to being shot in Forty Fort was probably also made in part at Hillside Farms in the Back Mountain. Tuzinski said he thinks that in addition to offering attendees a glimpse at the Wyoming Valley’s local film history, Friday’s “Adult Night” also will provide some great entertainment with “Casablanca” as the feature film. “I think a lot of people have never seen it. They know the cultural reference, so I thought It’d be a good movie to show,” Tuzinski said. Set-up will begin around 8 p.m. and the movies will start at dusk. And movies aren’t the only special events this summer at the park. Tuzinski noted that the Forty Fort Pool will host a Christmas in July Party beginning at 1 p.m. Saturday. Last Friday, the park committee presented a family movie night with “How to Train Your Dragon 2” followed by a “Pool Olympics” on Saturday. Reach Steve Mocarsky at 570-991-6386 or on Twitter @TLSteveMocarsky. 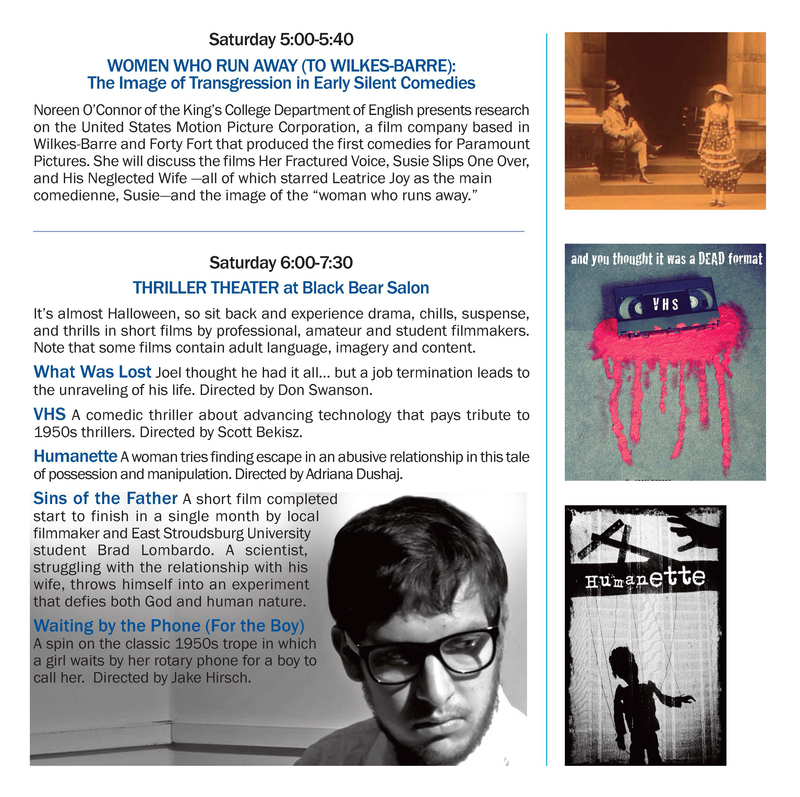 On October 17, 2014, at 5:00 pm, Noreen O’Connor of the King’s College Department of English will present “Women Who Run Away (to Wilkes-Barre): “Susie” and the Image of Transgression in the First Paramount Silent Comedies” at the Black Bear Film Festival Salon. 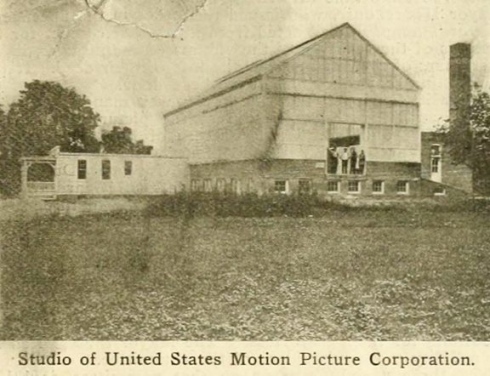 The United States Motion Picture Corp. studio on Slocum St. in Forty Fort in 1916. On a bright early summer day in 1917, people stopped to stare as a big man ran pell-mell along a busy street in downtown Wilkes-Barre. It wasn’t the man they were staring at – it was the camera crew filming him. The studio in Forty Fort is long gone and, until recently, all but forgotten, most of its one-reel productions lost to time and nitrate film deterioration. But recent efforts, particularly by King’s College English professor Noreen O’Connor and local historian F. Charles Petrillo, are reawakening interest in the glory days when the Wyoming Valley was a sort of Hollywood on the Susquehanna River. 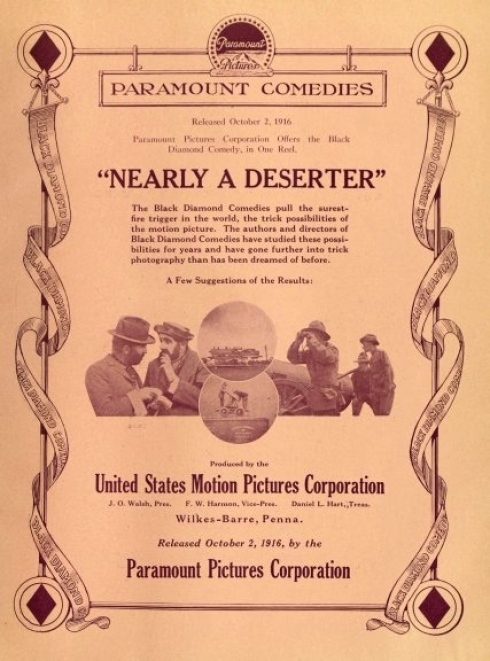 The first Paramount Pictures comedy, “Nearly a Deserter,” was filmed and produced by the United States Motion Picture Corp. of Wilkes-Barre. With the surge in popularity of motion pictures in the early 1900s, studios began springing up along the East Coast, including in Northeastern Pennsylvania. By the 1910s, Wilkes-Barre native Lyman H. Howe’s “high class” moving picture shows had been entertaining crowds for two decades, and his city-based studio pioneered aerial photography in 1911. Lackawanna County had the Scrantonia Photoplay studio, which in 1918 made short comedy films starring San Francisco-born Chinese actor Charlie Fang. And Wilkes-Barre had the U.S. Motion Picture Corp., headquartered in the Savoy Theatre building on Public Square. “The plant will be located in Forty Fort at Wyoming Avenue and Slocum Street, where we have purchased a very valuable plot of ground,” Hermann stated in an October 1914 ad in Wilkes-Barre’s Sunday Independent newspaper. James O. Walsh, a New Yorker, was president of the company. He was the one who interested local guys in the deal – and who had the money to back it. Daniel L. Hart, an award-winning Broadway playwright, was one of the founders of the United States Motion Picture Corp. He was mayor of Wilkes-Barre in the 1920s. Rounding out the trio was Daniel L. Hart, the company’s treasurer. 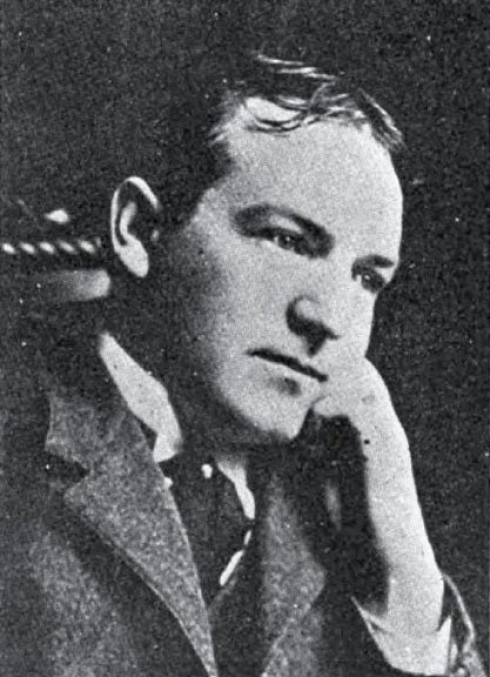 Hart had already achieved a degree of fame as a playwright–his works include “Parish Priest” and “A Rocky Road to Dublin.” He would go on to become a popular four-term mayor of Wilkes-Barre. So by fall of 1916, the U.S. Motion Picture Corp. had the financing, local talent and a brand-new, state-of-the-art studio in Forty Fort. All the fledgling film company needed was a contract. Paramount Pictures, founded in 1912, contracted out the production of many of its motion pictures in its earliest days. The company distributed the films to theaters around the country. Movie houses showed short subjects including comedies, newsreels and documentaries along with the main feature. And in 1916, Paramount needed some humor in the mix. The first Black Diamond comedy was supposed to be issued on Sept. 25, 1916, but “Nearly a Deserter” didn’t hit theaters until October 1916. 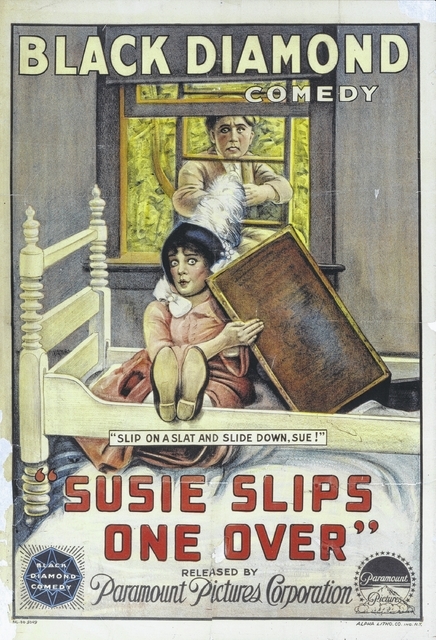 An advertisement for “Susie Slips One Over,” a United States Motion Picture Corp. Black Diamond Comedy released by Paramount Pictures. The U.S. Motion Picture Corp. “worked out a process for trick photography, hitherto unknown to motion pictures,” Walsh wrote. In the first flush of success, Walsh undoubtedly didn’t realize those words would come back to haunt him. For the rest of 1916 and all of 1917, the company churned out one-reelers at the rate of about one every two weeks. These were shot around the Wyoming Valley and used largely local – and uncredited – talent. The tall and portly Carl Dally was a repeat performer; so was diminutive Billy Thomas. Wilkes-Barre police Chief Russ Taylor was a cameraman. 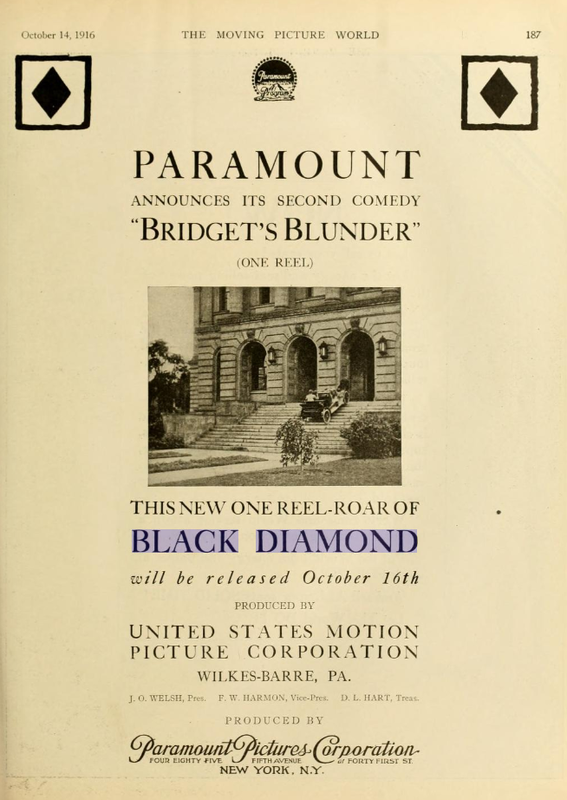 Particularly striking is advertising for the second Black Diamond Comedy, “Bridget’s Blunder,” about a cook in love with a cop. It shows a car driving up the Luzerne County Courthouse steps. “Her Fractured Voice,” one of the surviving Black Diamond comedies, features a scene shot in downtown Wilkes-Barre at the fountain in Public Square. The male lead – who likely was a local resident – runs down a side street to get there, to the amusement of passers-by who are more interested in the movie crew filming him. Another location in “Her Fractured Voice” is Hillside Farms. “Many neighborhood kids were hired to act as extras, particularly in front of the old blacksmith shop nearby,” Mildred Newitt Hogoboom noted in a pamphlet on the history of Jackson Township. A Still from “His Neglected Wife,” A United States Motion Picture Corp. comedy filmed at the Hotel Sterling in Wilkes-Barre. An ad for the Palace Theater in Plymouth for Feb. 18, 1917, indicates the Black Diamond comedy “Braving Blazes” was filmed on South Street in Wilkes-Barre. Likewise, “Wits and Fits,” which showed at Plymouth’s Hippodrome the week of Sept. 16, 1917, featured “all local scenes.” “A Troublesome Trip,” released in November 1916, featured scenes shot on North Street in Wilkes-Barre and Wyoming Avenue in Kingston. An apparent Black Diamond trick was to make a car look like it was driving on the surface of Harveys Lake. One of the lost comedies, “Their Counterfeit Vacation,” was shot there, Petrillo said. “If I could find only one film from the company, it would be that one,” he said. A later comedy, “His Neglected Wife” was filmed in part at the Hotel Sterling; the female lead signs in the register that she’s from Pittston, O’Connor said. “It’s all local,” she said. 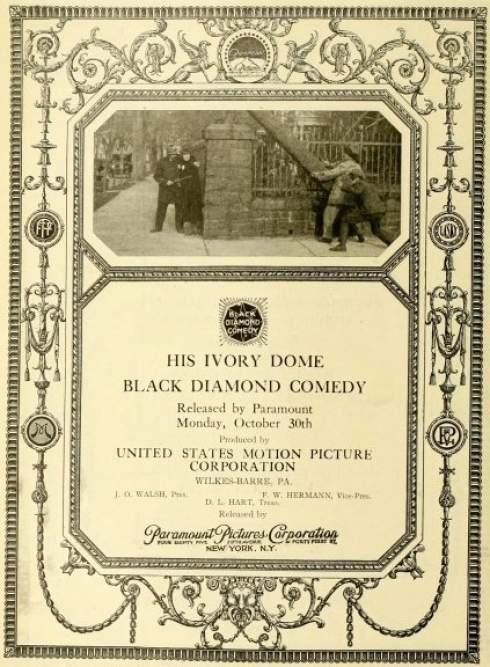 The Black Diamond comedies proved popular, and an article in the July 7, 1917 edition of “Motography” reported that the U.S. Motion Picture Corp. was enlarging its studio, including an entire section devoted to the trick photography used in the comedies. Actress Leatrice Joy appears in a promotional photograph in 1916 as she joined the cast of Black Diamond Comedies. Joy went on to become a successful Hollywood actress. “During the past week additional players have been secured by the company which will surround Miss Leatrice Joy, the leading lady who has done clever work and won many admirers,” the article states. The company established a script writing department that offered $5 per word for every idea of up to 50 words. They received more than 500 submissions. Unfortunately, the optimism – and expenditures – were misplaced. The U.S. Motion Picture Corp. lost its Paramount contract. The new studio didn’t materialize, and in 1918, the U.S. Motion Picture Corp. shifted to making Rainbow Comedies, distributed by the General Film Co. The first of these was a World War I-related short called “Nearly a Slacker,” released in September 1918; another was “Hooverizing,” named for a popular World War I slang term that meant economizing, after Herbert Hoover (who was National Food Administrator at the time). But by 1920, the U.S. Motion Picture Corp. was in decline. That year saw what was likely the last filming ever done at the Forty Fort studio: “A Woman in Grey,” a 15-part serial starring Arline Pretty. Post-World War I, the movie industry made an exodus to California, where the weather was more suitable for filming year-round. It was after 1918 that the U.S. Motion Picture Corp. went into a decline. “They were producing one-reel comedies, and the art of the silent movie had moved beyond these,” he said. O’Connor noted that some of the Black Diamond players did go on to Hollywood, like New Orleans native Leatrice Joy who played Susie Speed, a recurring character. Joy, a versatile and talented actress, rose to silent movie stardom in Paramount features throughout the 1920s. Another U.S. Motion Picture Corp. alumnus, Rex Taylor, who wrote the scripts for the Black Diamond comedies, went on to have a respectable career as a Hollywood scriptwriter. After “A Woman in Grey” wrapped up, the Forty Fort studio sat idle for few years. The Sunday Independent reported its fate in a June 17, 1923 brief: “The Black Diamond motion picture studio in Forty Fort was sold yesterday to Albert Jones, a school director of Luzerne Borough. The new owner secured title to the property from Freedman and Dattner, who purchased the building and some surrounding ground a short time ago. Jones did, but the “Do Right Laundry” was a washout. After years of neglect, during which kids broke the many windows with rocks and local men used the basement for poker nights, the studio was demolished. In the silent era, motion pictures were made on nitrate film, which was not only highly flammable, but also prone to decay and disintegration. Petrillo estimates 70 percent to 80 percent of all silent films are lost due to deterioration, including most of the U.S. Motion Picture Corp. productions. O’Connor discovered the U.S. Motion Picture Corp. through Luzerne County Historical Society Executive Director Tony Brooks, whom she had invited to talk to her New Media class about interesting people from the area. One of the topics he mentioned was the local film industry. O’Connor, a native Californian who always loved movies – particularly Charlie Chaplin’s – was intrigued. “When Tony said there were these films, I said, ‘Tell me more.’ But he didn’t know any more,” she said. So O’Connor obtained a summer grant from the Shoval Center at King’s and she and her class started researching. “This project is one where you find a piece and you find a piece and you find a piece,” she said. O’Connor’s students wrote articles compiled in a blog, blackdiamondcomedies.org, and put together material online for Wikipedia. The Wikipedia Black Diamond page didn’t exist until her students created it, she said. Then O’Connor tried to track down the films themselves. The Black Diamond production “Her Fractured Voice,” starring Leatrice Joy, exists in San Francisco’s Prelinger Archives and can be viewed online at archive.org. But others are harder to find. “What’s frustrating is not very many of them survived,” O’Connor said. Unbeknownst to O’Connor, Petrillo had already been researching the U.S. Motion Picture Corp. Last fall they discovered they had the same idea and helped each other out. Petrillo managed to unearth a copy of a U.S. Motion Picture Corp. comedy, “His Neglected Wife,” that turned up in a New Zealand archive in 2010. 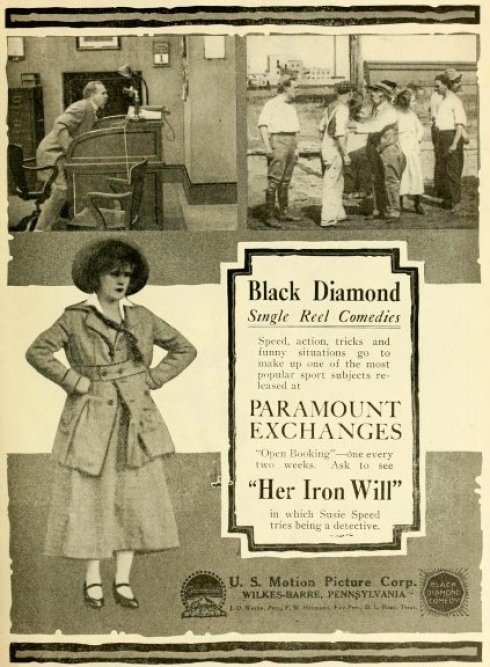 In 1918, New York-based Inter-Ocean Film Corp. took on Black Diamond comedies for worldwide distribution. These foreign markets did not send the movies back: it was too expensive and the films weren’t that valuable, O’Connor said. As a result, far-flung places have films you can’t find anywhere else, she said. “His Neglected Wife” is now in the hands of the National Film Preservation Foundation in San Francisco, where it was restored before finding a permanent home at the Eastman House museum in Rochester, N.Y.
“They were kind enough to provide a copy to me,” Petrillo said. It will be shown at a presentation O’Connor and Petrillo will give at Misericordia University on April 17, along with another film O’Connor discovered. UCLA has most of the early Paramount Pictures holdings, including one of the Black Diamond films, “Susie Slips One Over,” featuring Leatrice Joy, O’Connor said. She ordered a copy. O’Connor thinks more films may have survived. She received another grant to do research this summer. “I still wonder if there isn’t something tucked away in an attic somewhere locally,” she said. If you go: Local historian F. Charles Petrillo and King’s College English professor Noreen O’Connor will give a presentation on the U.S. Motion Picture Corp. and the production of short silent Black Diamond Comedy films in the Wyoming Valley at the Back Mountain Historical Society meeting, from 7 to 9 p.m. on Wednesday at Walsh Hall, Misericordia University, in Dallas Twp. Admission is free. Some of the surviving Black Diamond comedies will be shown.